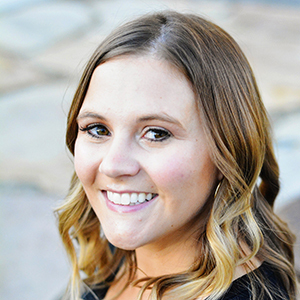 Plus there is a giveaway at the end of this post! But in the meantime, I can decorate my lovely new hearth! I built the hearth after much debate and I’m so glad I did it. Our room size can handle it and I love that I can sit and warm my buns by the fire in the winter. Plus we added a quartz top which makes it sparkle and shine and look all fancy. And bonus–I get to decorate it! 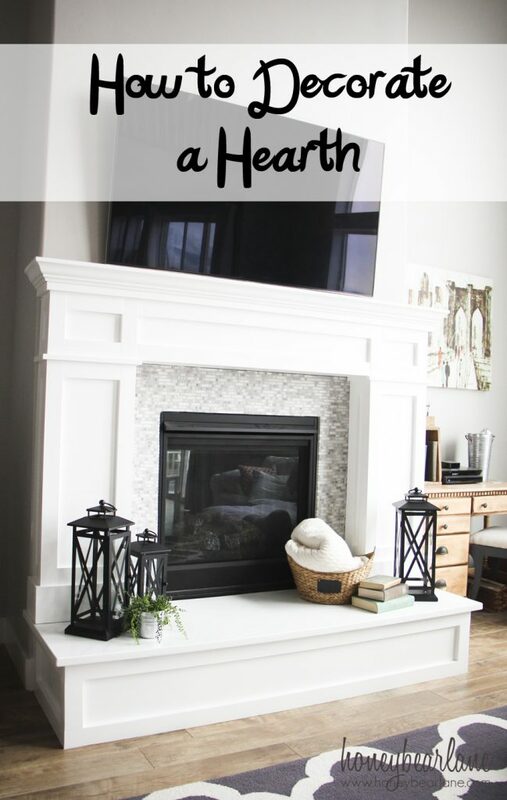 How to decorate a hearth though…that is a new challenge! It’s not hard at all. You need to think about composition and the size of your items. I like to work in groups, but not necessarily symmetry here. I don’t want the exact same things on either side of the hearth. I got these amaze-balls new lanterns from Walmart (Better Homes and Gardens brand) in Large, Medium, and Small just to play around with what I like best together. 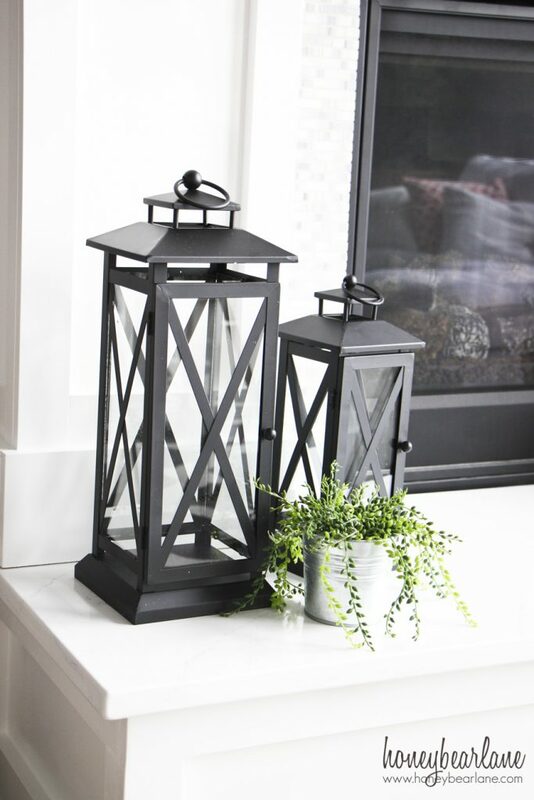 I have a thing for lanterns…they are so beautiful and versatile for decorating. I can take these outside if I want some light out there or just have them inside for ambiance. And using them with LED candles so I never have to worry about smoke or fire hazards! I group two of these big lanterns on one side and put things inside them. You can fill them with candles of course, but you can also put things like blossoms or shells or decorative balls inside. At Christmas you can put Christmas ornaments inside. 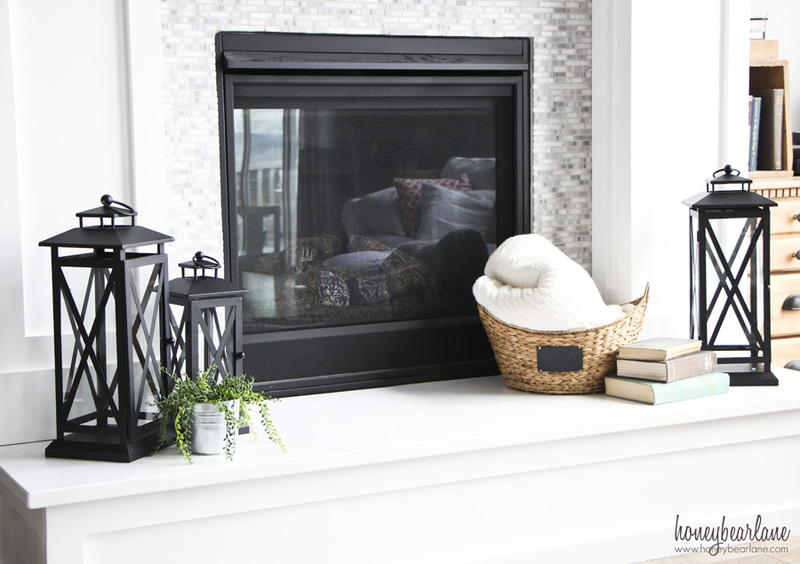 On the other side of the hearth I have this nice hyacinth basket from Walmart (BHG brand again) that is also super versatile. 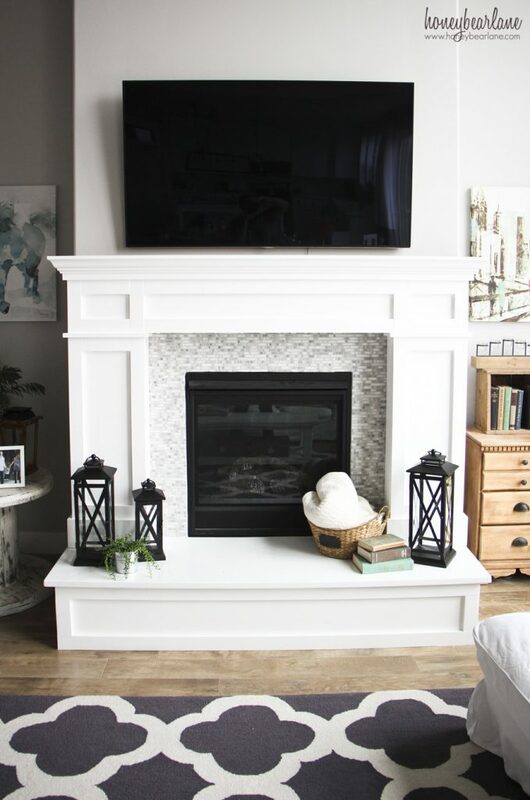 I could fill it with blankets or pillows, logs for wood burning (just for looks, this is a gas fireplace), or other kinds of greenery. That way if someone needs a blanket, it’s right there to grab. I also love the last little tidbits of decor, like the books and plants to add extra color and depth to the design. 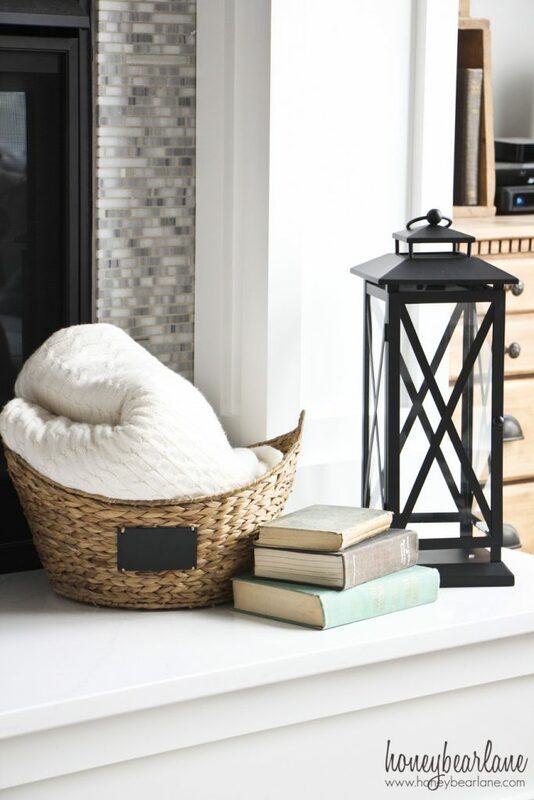 It’s super easy to refresh your house for any season or holiday by keeping some neutral staple decor items, such as the basket and lanterns but change up the things that go inside. For spring you can do blossoms and flowers and light airy colors and fabrics. For summer you can do seashells and sea glass and aqua colored items. Fall would obviously be things like fall leaves, wood logs, thicker blankets, pumpkins. And winter you can do pine boughs and pine cones, plaid wood blankets, Christmas ornaments, red velvet ribbons, Christmas lights, etc. Easy peasy. Want to win a $100 gift card to Walmart so you can get these items? Just enter the rafflecopter below. 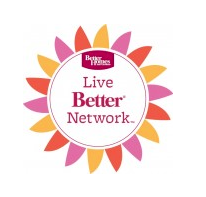 I am a member of the Better Homes and Gardens Live Better Network. All opinions are my own. Follow them on their social media sites! I would buy something nice for the home. I would buy new sheets and decorative items for the house! I would buy plants for my yard. I would buy a new rug for my porch, with a new outside chair, a planting pot to spruce up my front porch for Spring! I would buy a new vacuum so that i don’t have to borrow one every time i want to clean house. I’m looking for a nice duvet cover and some throw pillows!!! I am in dire need for sheets for my bedroom. Mine are all pilled up. Sheets are so expensive! I would by a new patio set. I would buy a new comforter. I really need to decorate our hearth but I would probably buy a comforter for my son’s new bed. I would buy some new plants or some lighting for our patio. I would like to buy an outdoor bench. I would buy a patio set for my deck. I would buy decorative wall hangings and mirrors. I would buy plants for my deck and front porch. I would buy new sheets. I would get some new towels and decor for my bathroom. I would buy a new dinnerware. 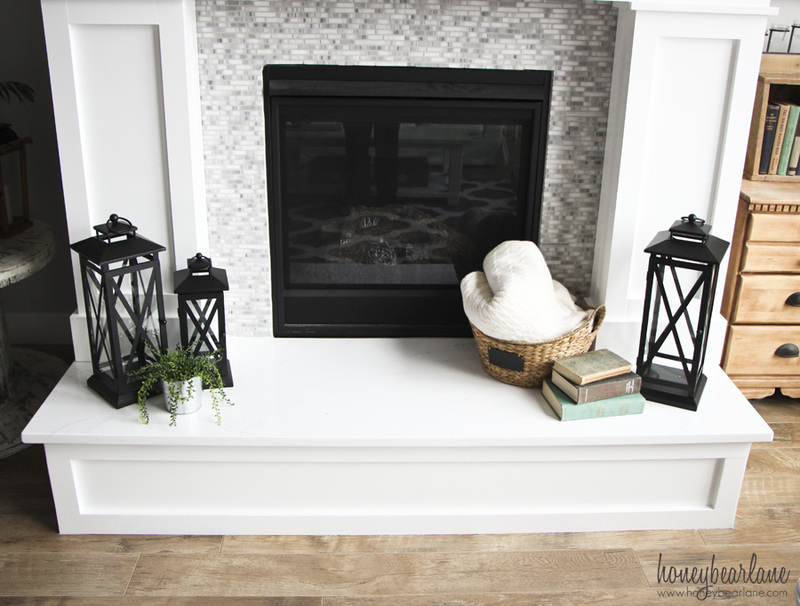 I am definitely in need of a mantel update. I love the use of the lanterns so I would buy some lanterns. I would buy some decorations for my yard. I would buy some flowers, vegetables and some gardening tools! We have a new gas fireplace and the cover comes with the insert. Sorry I can’t recommend something. I would put it toward a new patio set! I would get new rugs and plants. Your hearth is beautiful, I agree a sliding door or panel with art for the G tv. I need to redo the edging around my flower beds and clean out the awful cedar chips I put in there last year – what was I thinking????! What a mess! Thanks for the drawing. I would buy new curtains. I’d buy a curtain rod and groceries. I would put it towards a new patio set! I would totally buy those lanterns! I would get some new curtains for the living and dining rooms. There are so many things I could buy with $100 at Walmart! I’d start with some flowers and herbs with a nice planter for the deck, and I’d treat myself to a fun new kitchen toy (a new baking pan?). Then I’d probably buy some of the usual things, like dog and cat food. Thanks! A new tablecloth and outdoor decor for our space. I’d use it towards groceries. I would get some new dinnerware! I would buy outdoor toys. I would buy an outdoor rug or summer bedding. Clothes for the kids and groceries!